A new seafood recipe to stay fit during the holidays ! I do not know about you but after 9 days in Irland and all its excesses, I do need to loose some weight ! So here you go with a splendid mackerel recipe, one of my favourite together with the sole of course. This is a really basic recipe that I am sharing with you today, however very tasty. I find really hard to have always new ideas regaring seafood, so here you get one of mine. 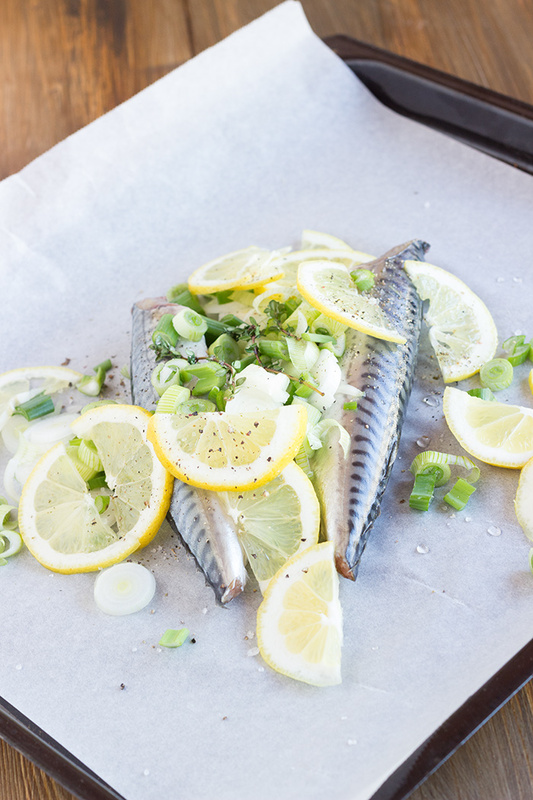 Spring onions and lemons can be associated with almost anything and they are perfect with mackerels. A nice way to stay fit, fill the tank with vitamins and end summer in good spirit and well boosted for next winter. Unfortunately, I do not think that only one healthy diner with get rif of 10 restaurant meals and liters of Irish beers. I will have to work on it. Mackerels are also delicious grilled on a barbecue if you feel like it. Need to by some more to make new recipes ! To check out more recipes, have a look at the previous pictures ! Place mackerels on a greaseproof paper sheet. Cover with lemon and spring onion. Add a pinch of salt and pepper and lemon thyme. Close the papillote and bake for 15 minutes.